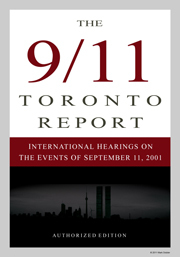 International Hearings on the Events of September 11, 2001: It is with great excitement that I announce the release of the Final Report of the Toronto Hearings, which is titled The 9/11 Toronto Report. It is now available for purchase on Amazon.com, for a reduced introductory price of $12.76. I encourage you to review the content of the book using Amazon’s “Look Inside” feature, and if you like the book, leave a positive five-star review. The book has already received a one-star review from someone who has not read the book, and we need to counteract these kinds of reviews. The 9/11 Toronto Report is a collection of essays submitted by the witnesses who presented at the International Hearings on the Events of September 11, 2001, which were held in Toronto, Canada over the 10th Anniversary of the attacks. I collected the essays, edited them, and arranged them into the chapters you find in the book. I believe it is the most succinct, comprehensive, and persuasive written treatment of the best evidence against the official story for 9/11 that has been produced to date. Those experts who contributed chapters include David Ray Griffin, Kevin Ryan, Peter Dale Scott, Graeme MacQueen, David Chandler, Richard Gage and many others. The 9/11 Toronto Report also contains a written report and recommendation from each of the four distinguished panelists who heard the evidence presented over the four days of hearings and questioned the witnesses. These include two eminent Canadian academics, an American civil engineer and academic, and the most famous and influential judge in Italy and honorary president of the Italian Supreme Court, Ferdinando Imposimato. As you will read in the final chapters of the Report, the opinions of these four individuals, each of which carries credibility and weight that cannot be disputed, make a clear and unmistakable case that the official account of 9/11 is false, and that the only way to realize truth and accountability is to tear down the wall of secrecy and lies that has been erected by the United States government around the events of 9/11.